Foot care is important throughout every human’s lifetime, but there are special considerations that need to be taken as we become older. We will take a look at some of these in this blog post, but remember – Richardson Podiatry Center is also available to help! Wear the right shoes. Choose ones that provide good grip on the ground (nonskid soles), have slight flexibility in the toe box area, and fit correctly. Remove hazards and use light. Maintain wide, unobstructed areas in which to walk and use night lights in bathrooms and hallways. Use assistive devices. Handrails in stairways, grab bars in the bathroom, and a cane are ideas that will lower the risk of a dangerous fall. Falls aren’t the only concern when we discuss foot issues that affect the older populations, though. 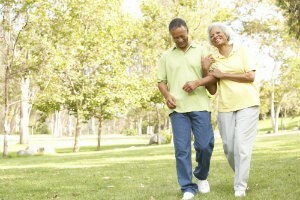 The National Institute on Aging recommends staying active, and we whole-heartedly agree. There are various reasons that exercise and physical activity are important as feet age, including the positive benefits that exercise has on osteoarthritis. Osteoarthritis causes joint pain and stiffness for millions of older residents across our country. It might seem counterintuitive to move more often when joints hurt, but exercise can actually help fight the symptoms of arthritis by strengthening muscles that support the joints, increasing flexibility, and even shedding pounds to place less stress on the lower limbs. In addition to fall prevention and exercise, it is also important to be mindful of skin and health care. As we become older, our skin begins to lose its elasticity. This can be problematic for the lower limbs, especially given that feet do not have oil glands and, instead, rely on many sweat glands for moisture. You can help your feet by applying moisture daily. For optimal results, apply moisture to the tops, bottoms, and heel areas of your feet in the morning after bathing and before going to bed at night. Be sure to avoid the areas between the toes, though, as it could otherwise lead to heightened infection risk. These senior foot care considerations can be used as a starting point to create a plan to keep you or your loved ones safe, but you may want to come see us and have our professionals help. We are more than happy to provide additional information and answer your questions when you contact us online. If you’re ready to schedule an appointment with us, you can do so by calling (972) 690-5374. One of our staff members will be happy to help.